Chicago Fire: Cancelled or Renewed for Season Six on NBC? Will the men and women of Firehouse 51 continue to save the day? Will viewers continue to watch? Has the Chicago Fire TV show been cancelled or renewed for a sixth season on NBC? The television vulture is watching for the latest cancellation and renewal news, so this page is the place to track the status of Chicago Fire, season six. You can bookmark this page or subscribe for the latest updates. Remember, the television vulture is watching your shows. Are you? Airing on the NBC television network, Chicago Fire follows the lives and work of the firefighters, Rescue Squad, and paramedics of Chicago Firehouse 51. No occupation is more stressful or dangerous, yet so rewarding and exhilarating. These courageous men and women forge headfirst into danger when everyone else is running the other way. The TV show’s cast includes Jesse Spencer, Taylor Kinney, Monica Raymund, Eamonn Walker, David Eigenberg, Joe Minso, Yuri Sardarov, Christian Stolte, Kara Killmer, and Steven R. McQueen. The fifth season of Chicago Fire on NBC averaged a 1.52 rating in the 18-49 demographic with 7.05 million viewers. Compared to season four, that’s down by 12% in the demo and down by 12% in total viewers. Compare its standing against the other NBC TV shows we are tracking. 5/10 update: On May 10, 2017, Chicago Fire was renewed for a sixth season. It will debut on September 28, 2017 at 10pm. The ratings are down a bit this season but Chicago Fire is still one of NBC’s top scripted series. The network will surely renew it for a sixth season. The show has a large ensemble cast so, even if some performers want to leave, you can be sure Chicago Fire will be back. 5/10 update: NBC has renewed Chicago Fire for a sixth season. Details here. Check the rankings for all of NBC’s 2016-17 TV shows. Read other Chicago Fire TV series news or other NBC TV show news. What do you think? Do you think that the Chicago Fire TV show should have been renewed for a sixth season? How would you feel if NBC had cancelled this TV show, instead? More about: Chicago Fire, Chicago Fire: canceled or renewed?, Chicago Fire: ratings, NBC TV shows: canceled or renewed? 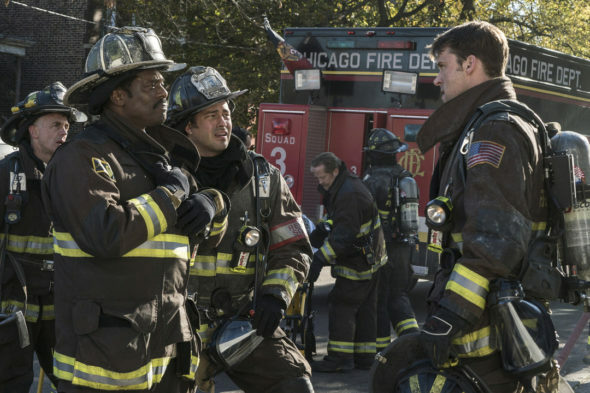 Chicago Fire on NBC: Cancelled or Renewed for Season Eight? Chicago PD: Is the NBC TV Series Cancelled or Renewed for Season Seven? Chicago PD: Cancelled or Renewed for Season Six on NBC? Chicago Fire: Cancelled or Renewed for Season Seven on NBC? Chicago Med on NBC: Cancelled or Renewed for Season Four? Chicago Justice: Cancelled or Renewed for Season Two on NBC? Chicago PD: Has the NBC TV Show Been Cancelled or Renewed for Season Five? Chicago Med: Cancelled or Renewed for Season Three by NBC? Please renew Chicago Fire,Chicago PD and Chicago Med.They are my favorite shows..My husband and children love them too!Thanks! Why are there only 6 episodes for the Fall season?? Season 6 just started!! Can’ wait for Chicago Fire, Chicago Med, and Chicago PD to begin their new season. They are my favorite shows. Please don’t cancel any of the Chicago fire or pd ,med. We watch every show. Love the shows. I enjoy watching Chicago Fire, Chicago P.D. and Chicago Med. I would be devastated if any of these three were cancelled. I am a big fan. Our teenage children need something to positive to watch. When they see the men and women putting out fires and saving lives and protecting the citizens, it motivates them to want to be someone when they grow up. Will my sons rob others and sell drugs? I certainly hope not. There are some shows that children think encourage this kind of behavior, but not the Chicago series. I love Chicago Fire it’s the best show ever. Please don’t cancel any of the shows. I look forward every Tuesday to see the show. I love all the Chicago series. Please don’t cancel any of the show. The show are full of heart, truth, struggle and strength. I love the whole Chicago franchise. Please please please DO NOT cancel Chicago Fire. I watch the entire franchise but Chicago Fire is my favorite. If I had to pick Fire is the only one I don’t want cut. Renew this show please. Don’t let any of them die on that fire. DAMN!!! !